A Lexington, Ky., police officer poses, jokingly, in front of a charred Krispy Kreme truck Monday. "No words," joked the department in a statement on Twitter, accompanied by a crying emoji. The tweet included photos of heartbroken officers posed near the charred vehicle. Video from the scene showed the white van engulfed in flames, black smoke pouring into the suburban sky. Responding officers found the city's fire department in control of the blaze. 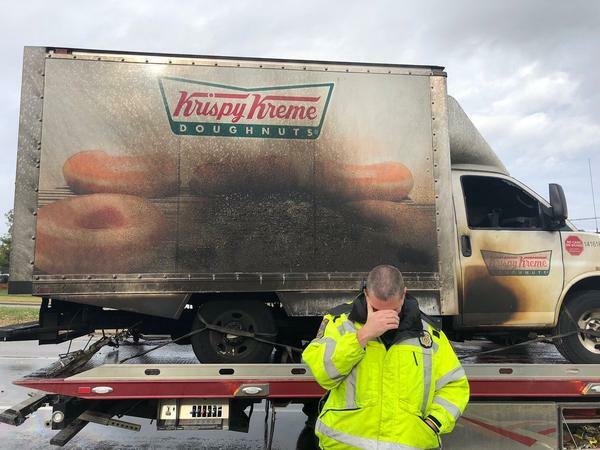 "The fire department came up with the great idea of us taking a picture in front of the Krispy Kreme truck," police department Public Information Officer Donnell Gordon told NPR. Then, the post went viral and support flooded in from around the globe, from police departments from Ohio, Indiana, New York City and the U.K. who felt the Lexington officers' pain. Amid the jokes, there were conflicting reports from local news outlets about the contents of the truck. One said there were doughnuts onboard; another said none were harmed. Gordon clarified that although the driver of the van was uninjured, some innocent pastries were indeed incinerated. The relationship between police officers and the circular, glazed treat is well-documented. It began around the middle of the last century when officers started finding sustenance and a place to rest in doughnut shops that would open early in the morning or close late at night. "We do love doughnuts," Gordon confirmed by phone, adding that his colleagues aren't bothered by stereotypes about their love of the food. "That's why the officers were so upset," he said, with what we're sure was not a giggle. Krispy Kreme management heard their pain (or at least recognized a marketing opportunity) and announced the next day that it would be sending consolation doughnuts to the police force. "Hope," tweeted the department. And they didn't have to wait long. On Wednesday afternoon, four squad cars — lights flashing — escorted an undamaged Krispy Kreme truck to a neighborhood police station. Officers applauded, then helped unload their 20 dozen fresh doughnuts. Gordon explained there was only one flavor in the delivery, the 190-calorie Original Glazed, the best choice for busy law enforcement professionals. "They can go down quite quick," Gordon said. "You don't have to worry about any jelly filling getting on you."